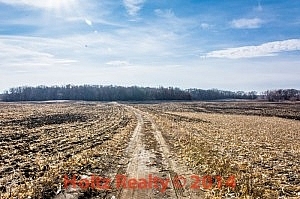 Share the post "The Perfect Place to Go 100% Green"
The 84 acre farm that I just recently listed southwest of Northwood has been popping in my mind quite a bit lately. The more I think about it, the more I consider going forward in time, all the opportunities there are with this property. There is about 20 acres of old growth timber and the remainder is farmland. 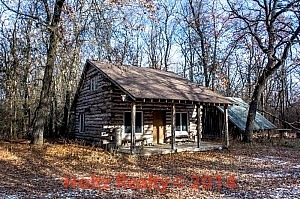 What I find very appealing about this site is that it has a very well constructed hunting cabin in the wooded area which would be a great structure to spring-board from with other construction projects. I can see one allowing the drained natural pond to re-fill, I can see a portion of the acreage planted with fruit trees, I can see a pasture area being fenced off for natural beef production and much more. 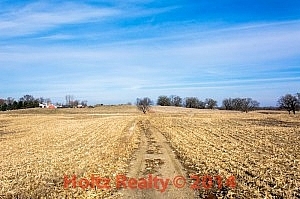 The farm borders Simes Woods which is managed by the State of Iowa. The access to the property from Mason City is superb. All the roads are hard surface with the exception of about 1/8 of a mile. It’s about a 20 minute drive from downtown. Anyone who is even thinking of going off the grid would have all the natural tools waiting for them. The long meandering driveway to the wooded area would provide even more privacy for someone who would choose to build a home and out-buildings. When I was there taking photos, I was quite taken by the lack of human created noise. That’s all I could hear were the birds and the wind blowing through the trees. Now that’s what I consider being out of reach of today’s noisy world. The views from this property of the countryside is breathtaking. Whomever is the lucky person to own this property will have endless years of enjoyment. I think a person could even write a book living amongst the serenity this land offers. If anyone is even slightly thinking of taking a big step towards going natural, this land is the perfect place to work towards going 100% green.